A native of Madison, Amanda lives on an acreage near Humphrey with her husband, Matt, daughter, Triniti, and son, Joshua. Three dogs and four cats complete their family. She enjoys riding on ATVs, running, gardening and reading. "Mandy" received her degree in dental hygiene from Central Community College in Hastings in 2004. Before joining our practice, she worked in Missouri and Dodge, Nebraska. 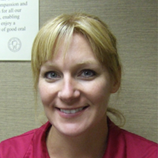 Mandy is also certified in administering local anesthesia.